April is National Poetry Month. 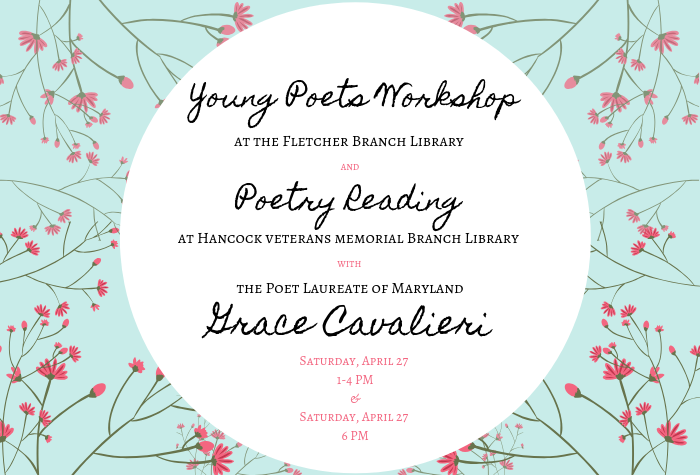 Please join us for a day with the Poet Laureate of Maryland, Grace Cavalieri! This workshop is an opportunity for teens and young adults to explore their creativity. Learn about the poetic process with Grace Cavalieri. Reigstration is required. Call 301-739-3250 ext. 270 to register. Join us at the new Veterans Memorial Branch Library in Hancock for a Poetry Reading by Grace Cavalieri.